Sadly, we're going to have to wait a while for our fix of adorable baby griffin. There's not a lot of information getting out about Team Ico's latest game, The Last Guardian, and it seems that it's because development is taking longer than expected. Speaking at Gamescomm, Sony Worldwide boss Shuhei Yoshida admitted that work on the game was moving much more slowly than Sony had hoped. He stressed, however, that the work on the game was still ongoing and that the team was moving forward, even if there wasn't a whole lot to show people right now. "It's been very difficult in terms of seeing the progress," Yoshida said. "But we're still making progress, so I'd like to continue to support and keep waiting for great news sometime in the future." He also said that that the team was under a great deal of pressure at the moment, although didn't expand on that point. The Last Guardian - which, as you might expect, will be a PS3 exclusive - tells the story of a young boy and his baby griffin companion, Trico. The player has to help the unusual duo evade those who want to do them harm. 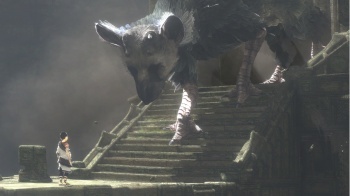 The game will primarily be a puzzle game, with the player using the Trico and the boy's different skills and abilities to overcome obstacles.